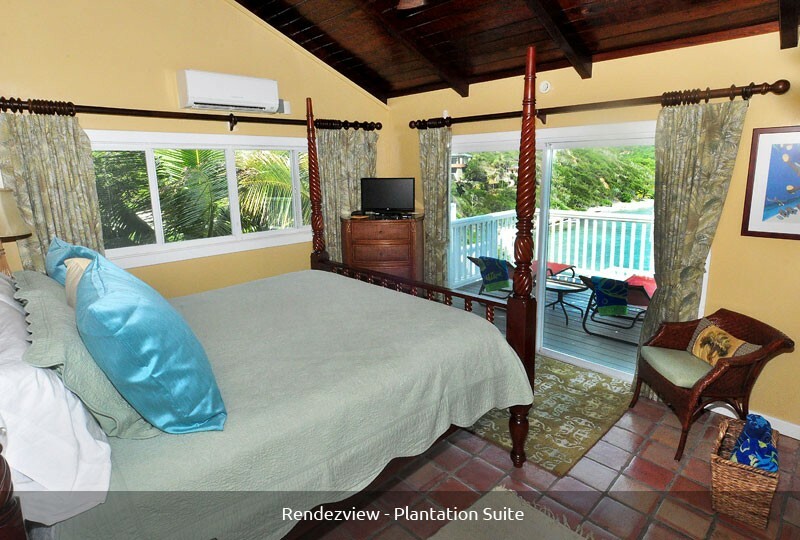 Please call or email to book at special pricing, FOR A 7 DAY RENTAL May 7 – June 1, 2019! 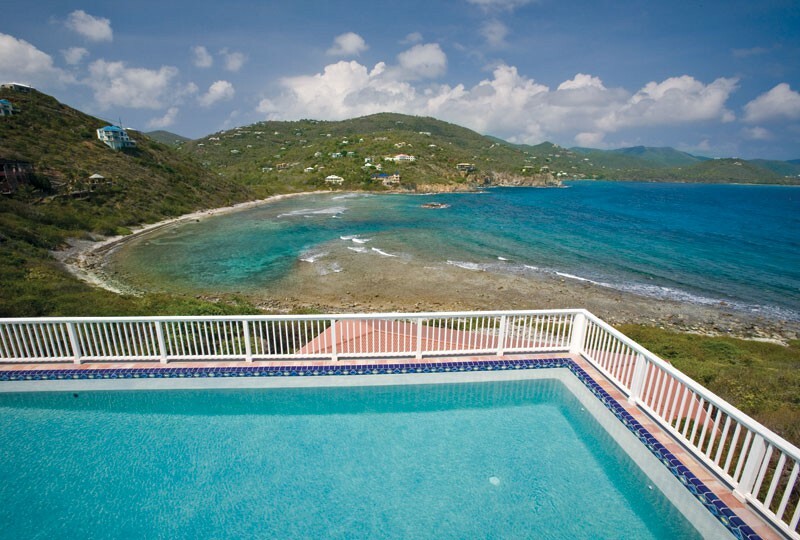 Located on the southwest end of Hart Bay, this beachfront villa is a perfect villa for newlyweds, families and small groups. 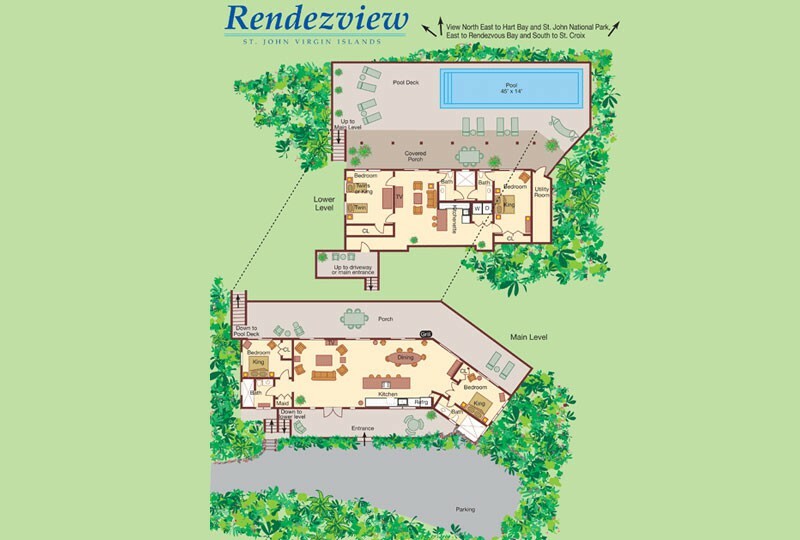 Convenient to the main town of Cruz Bay, shopping, dining and the famous North Shore beaches of the National Parks, this 4 bedroom 3 1/2 bath villa located on Hart Bay beach offers a combination of sophistication and romantic tropical charm. 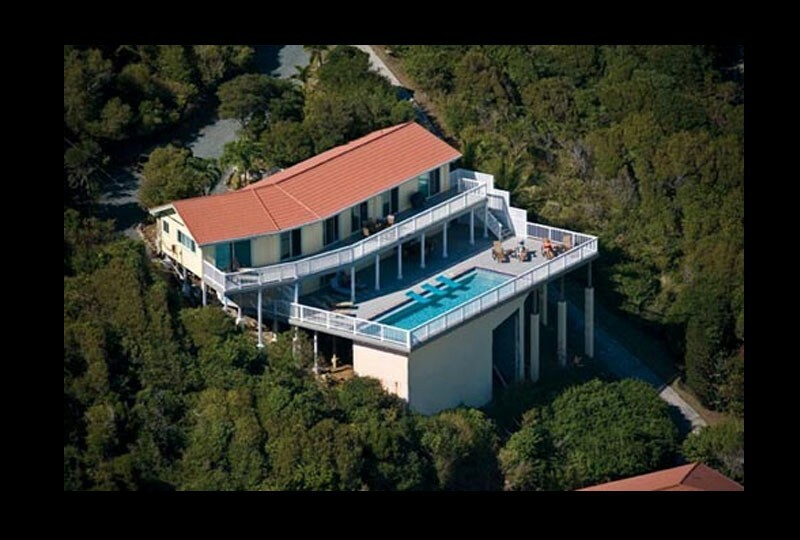 The massive 45 X 14 pool, 52″ deep with bench seating throughout and 3500 square feet in decking. The upper and lower outside decks feature glass top dining tables with seating for six on both levels. As an added safety feature, a gate as been added at the top of the stairs. 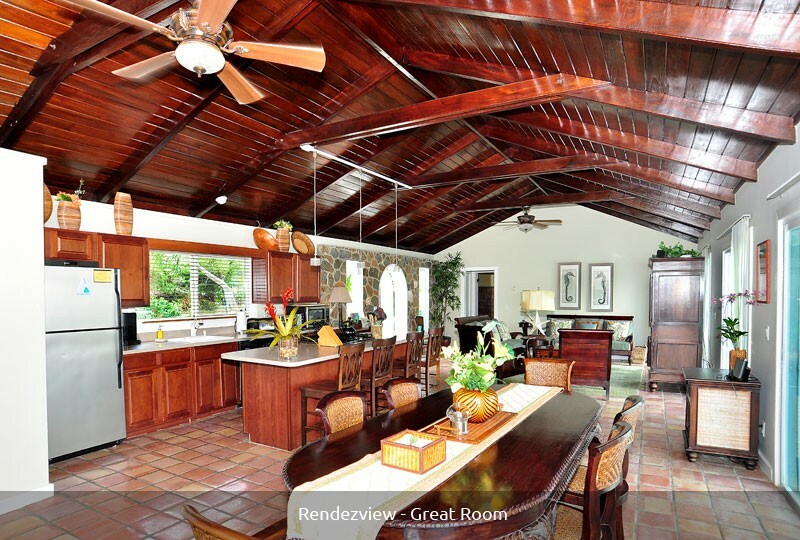 The beautiful gourmet kitchen features Corian countertops, mahogany cabinets, and ocean-view cooking. 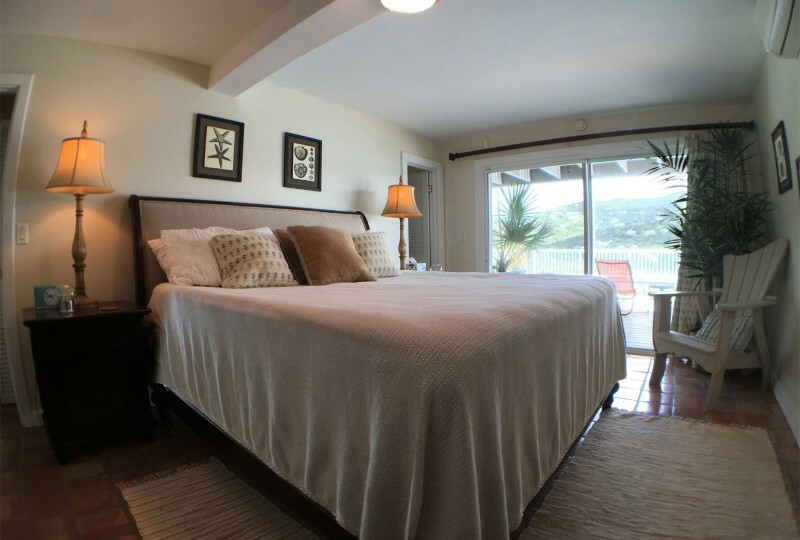 Included are refrigerator, gas top range and oven, dishwasher, microwave, and MANY additional amenities. Ideal for the gourmet chef. The formal mahogany dining table with seating for eight and a large mahogany buffet complete this pleasurable dining experience. 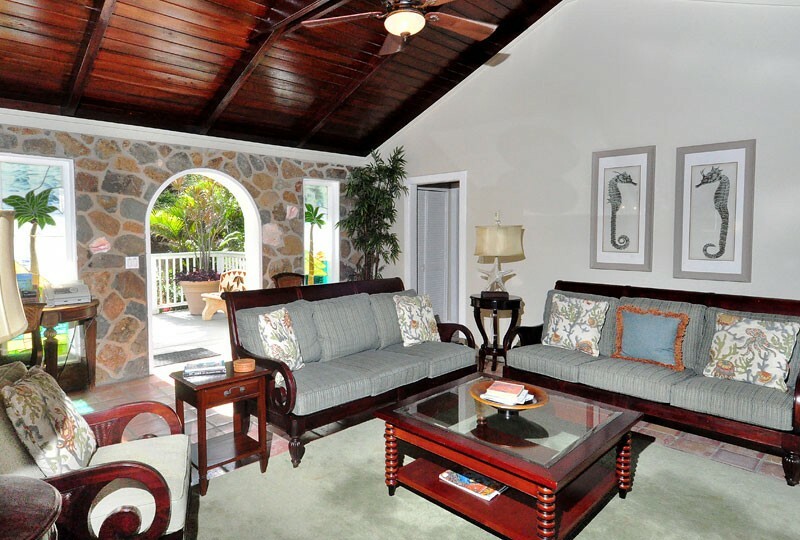 The Great Room features two, mahogany, plantations style sofas with large comfortable cushions and throw pillows. Two mahogany round side tables with beautiful starfish lamps for those who wish to relax or catch up on some reading. There are also two, mahogany, plantation style chairs and coffee table. 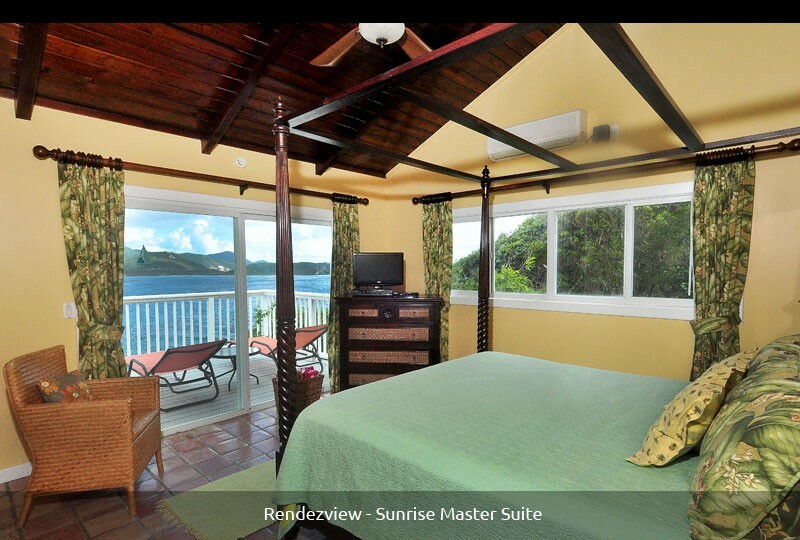 This arrangement of furniture gives you plenty of seating for watching tv or gazing out to the fabulous ocean views of the south to St. Croix and east to Ram’s head and the vast Caribbean Sea. The large mahogany armoire contains all the electronics for your viewing and listening pleasure: A 27″ Sony, flat screen TV with expanded digital cable, VCR, stereo, CD player and Bose SoundDock. The Sunrise Master Suite This lovely suite is named for the spectacular sunrises you see each morning from the mahogany, king size, four poster canopy bed. His and hers mahogany nightstands with matching lamps are included, along with a telephone, ceiling fan and air conditioning. 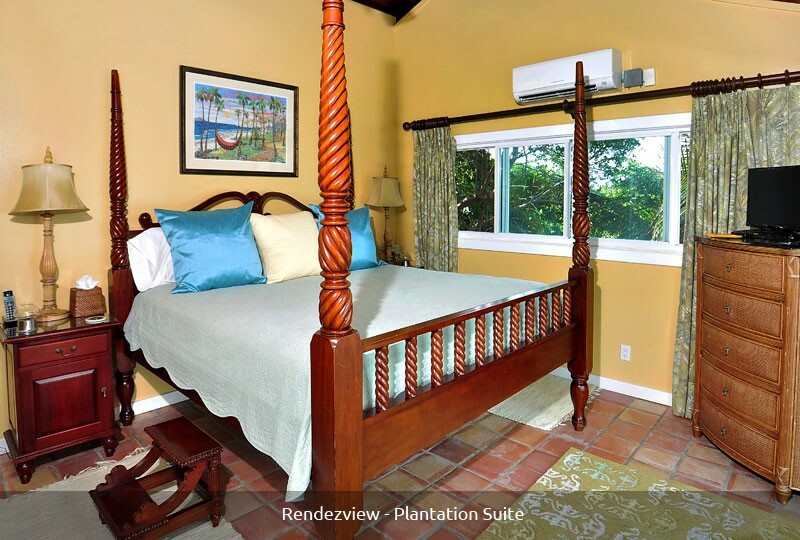 A mahogany & rattan four drawer dresser with large closet to house all your Caribbean attire. 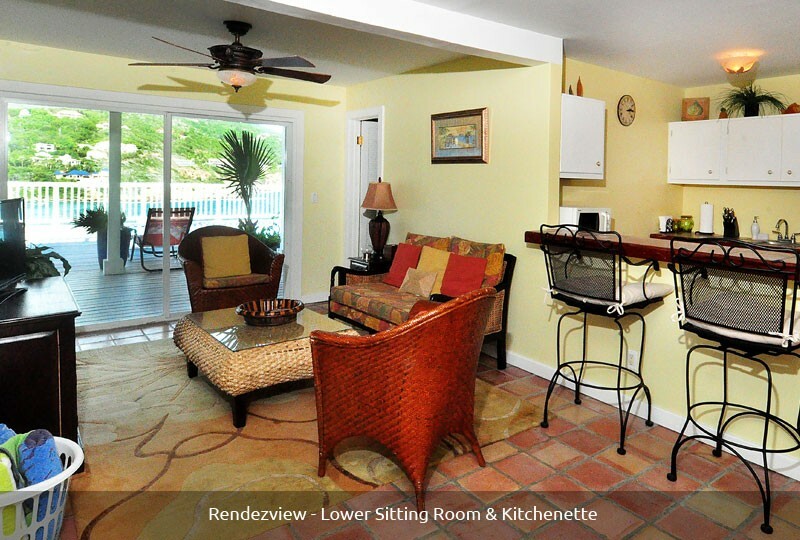 A sitting chair is available for watching TV on the 19″ Sylvania, flat screen TV with expanded digital cable service. 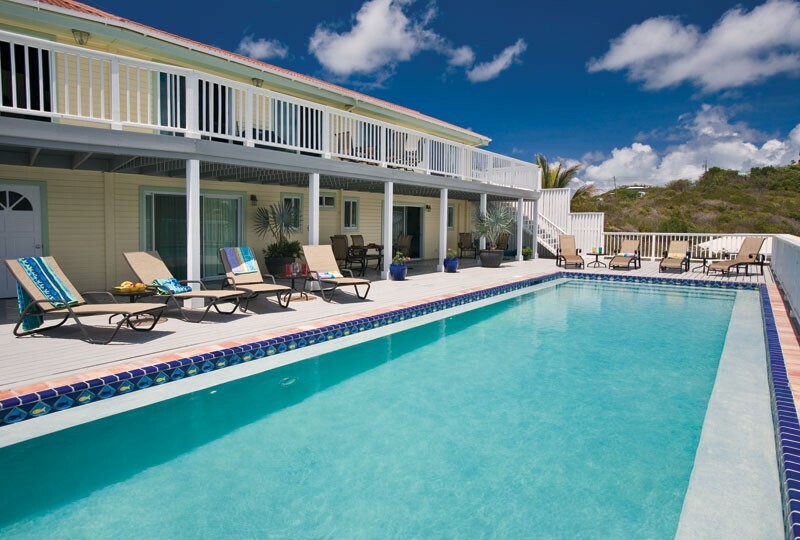 Sliding glass doors open to the outside deck where two relaxing chaise lounges await you. 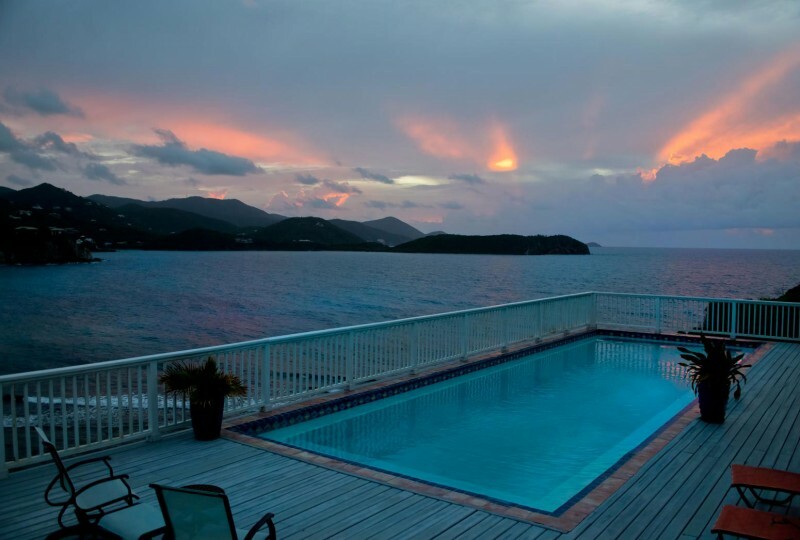 For soaking up the sun, watching the stars or enjoying the fabulous down island views. A private bath with spacious shower including a coral stone accent wall and view to the sea completes this fabulous master suite. The Plantation Suite The Plantation Suite contains a stately four poster mahogany king bed with matching nightstands. Each night stand has a lamp for reading, telephone and ceiling fan. 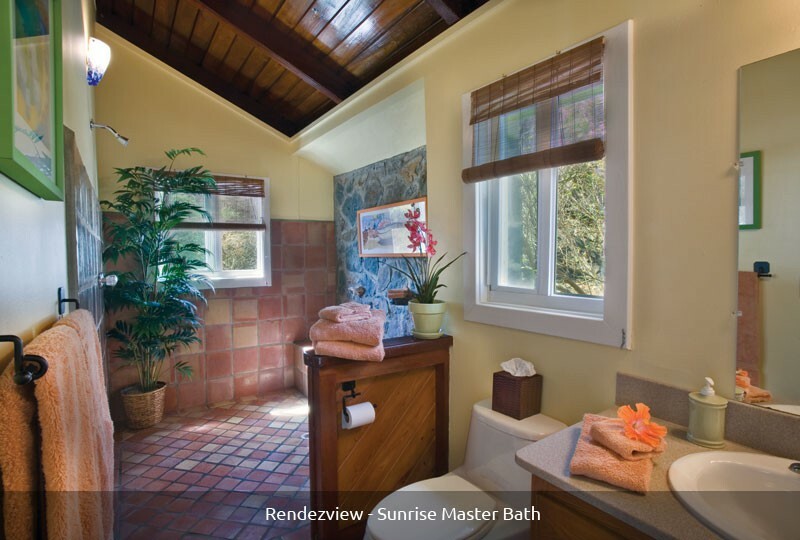 This suite is air conditioned with a full bath just outside containing a large shower and full size sink/vanity. 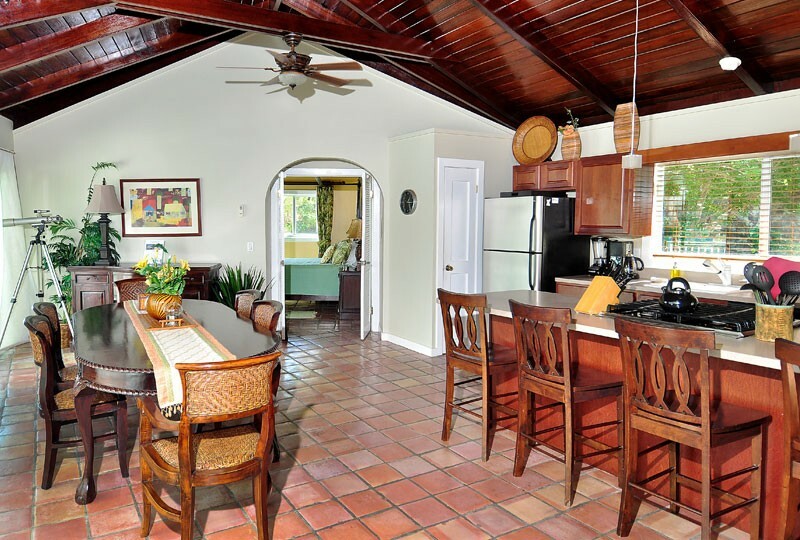 A large 4 drawer rattan dresser is included for all your island attire along with a large closet. 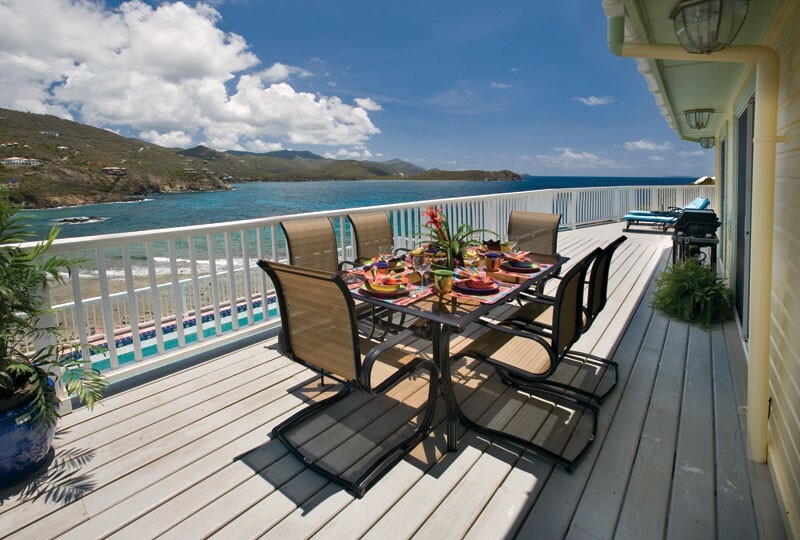 Sliding glass door take you out to the large deck with chairs or chaise lounges for relaxing by day or night. 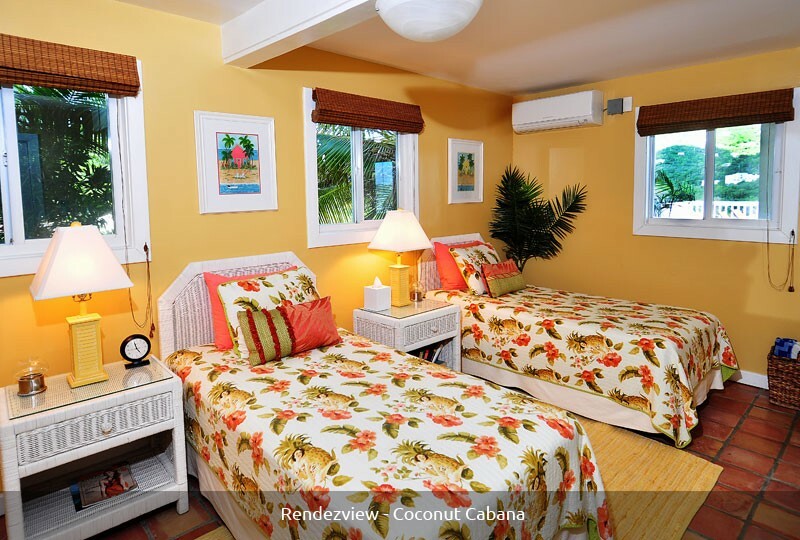 On the lower level is the The Coconut Cabana The Coconut Cabana has two twin beds that can easily be converted to a king. Cottage Style white wicker headboards with matching nightstands and lighting. 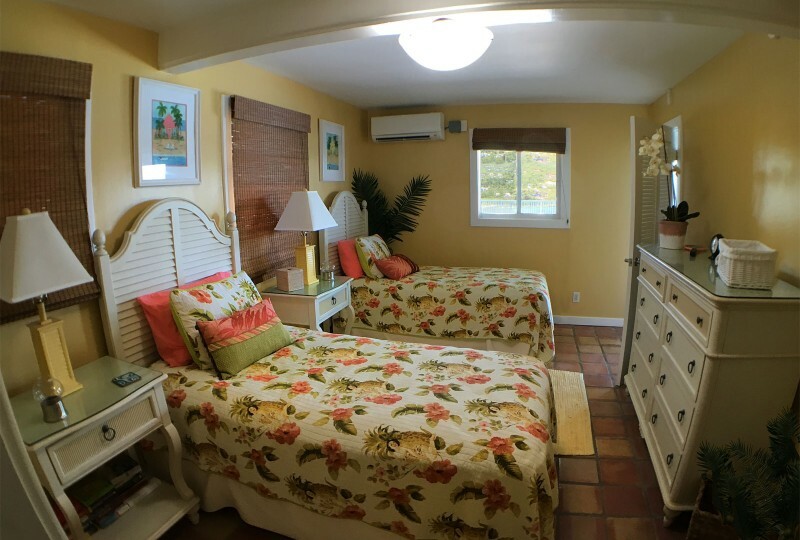 A circular mirror adorns the five drawer wicker/rattan dresser along with a large walk-in closet. 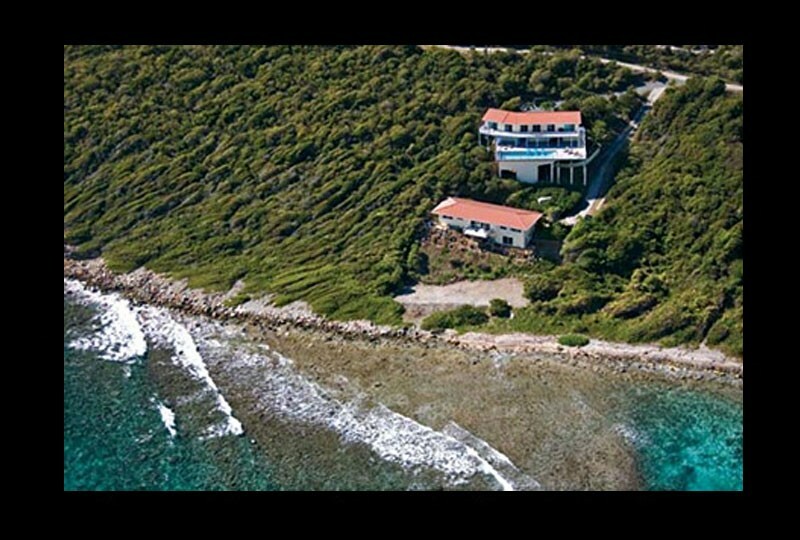 Three sliding windows allow for cooling tradewinds, or air conditioning & an oscillating floor fan is also available. 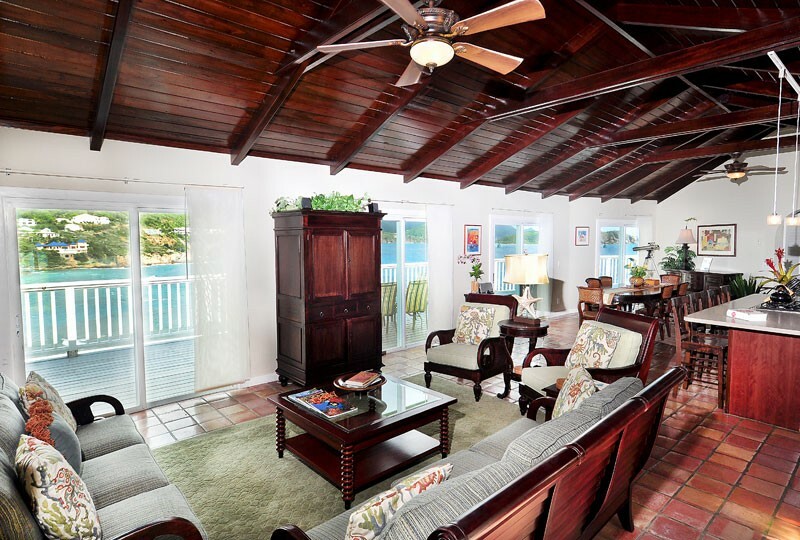 Two bedroom doors give easy access to the sitting room area just outside. 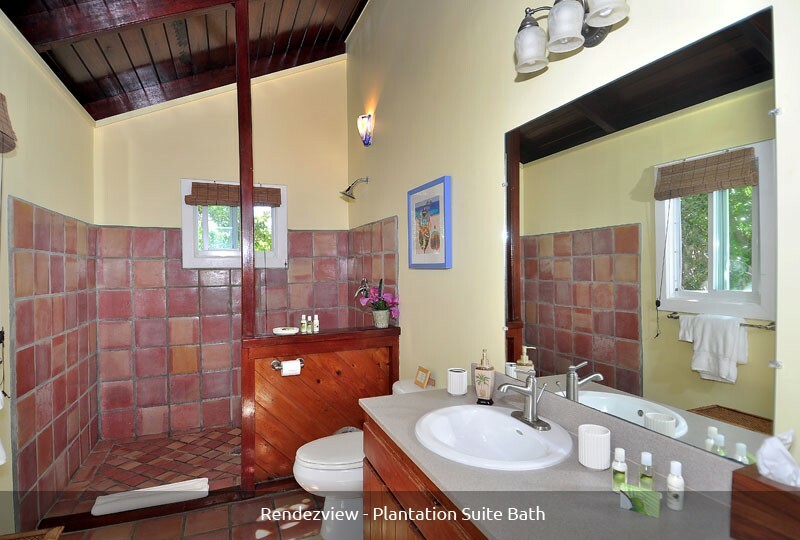 Directly across is the private half bath and adjacent shared shower. 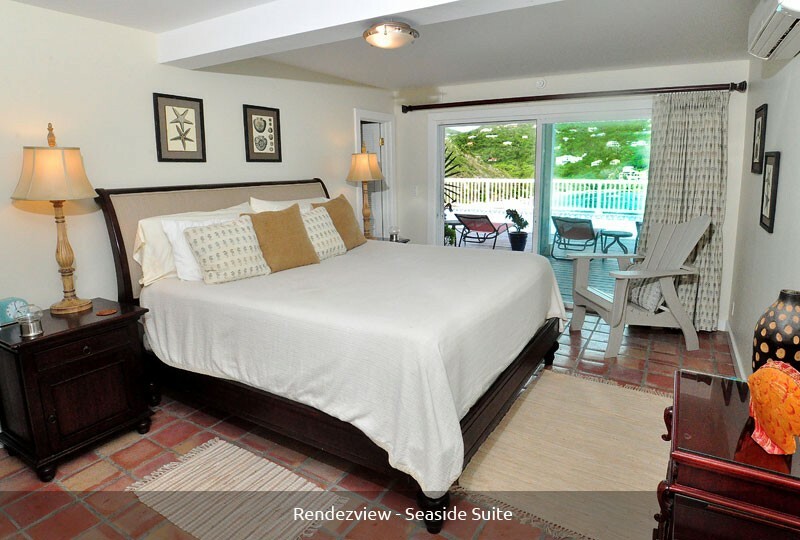 The Seaside Suite The Seaside Suite, located on the lower level is appointed with a stately mahogany sleigh bed including matching mahogany nightstands with one drawer and cabinet storage as well as matching table lamps. A lovely mahogany dressing table with small stool and mirror as well as a large closet for all of your vacation wardrobe. A sliding glass door opens to the expansive pool deck where a large rope style hammock and pillow are ready to relax in. 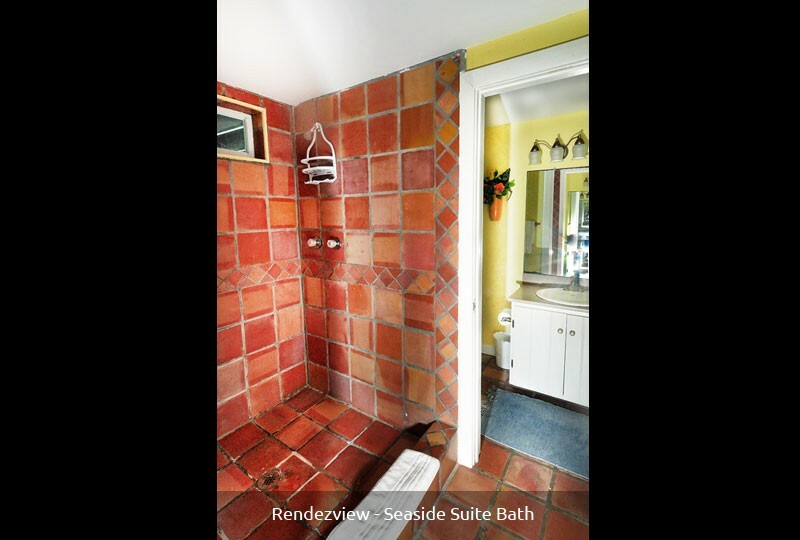 A private half bath with adjacent shared shower are included along with air conditioning, oscillating floor fan and large turquoise Adirondack chair for reading, listen to the sounds of the sea or gazing out at to the spectacular ocean view. 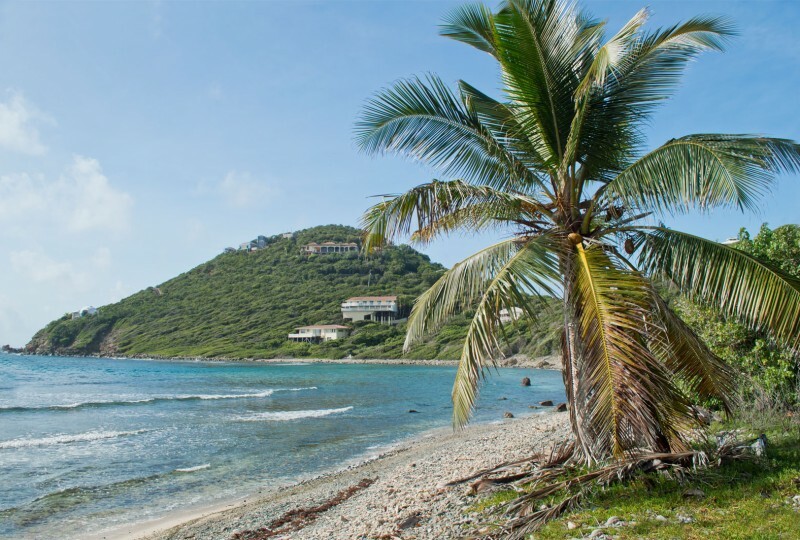 From the house take a short walk down the path to Hart Bay Beach where you can swim, snorkel or beachcomb to our Heart’s Delight!! 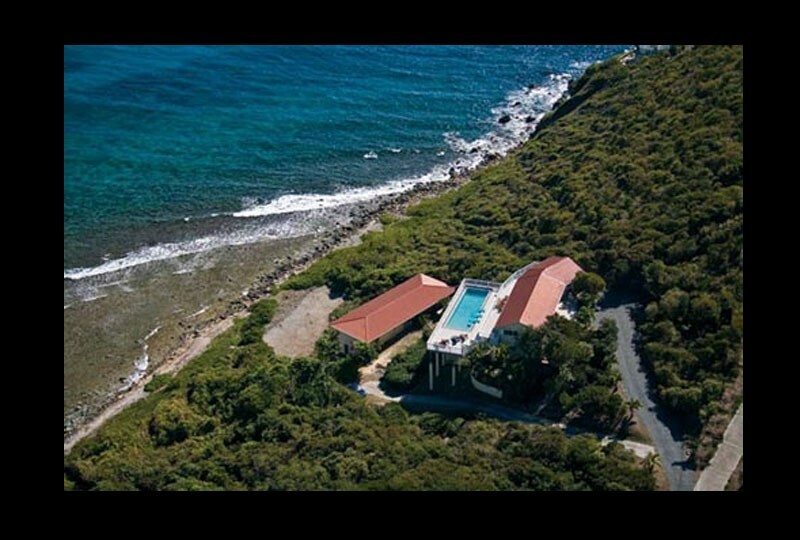 You’ll enjoy the villas convenient location, just 10 minutes to the town of Cruz Bay and 15 minutes to the Nation Park beaches. Deposit Information: A deposit of 50% of the total rent is required to confirm your reservation. The balance is due 60 days prior to arrival. The deposit is refunded if re-rented, less 20% administrative costs. 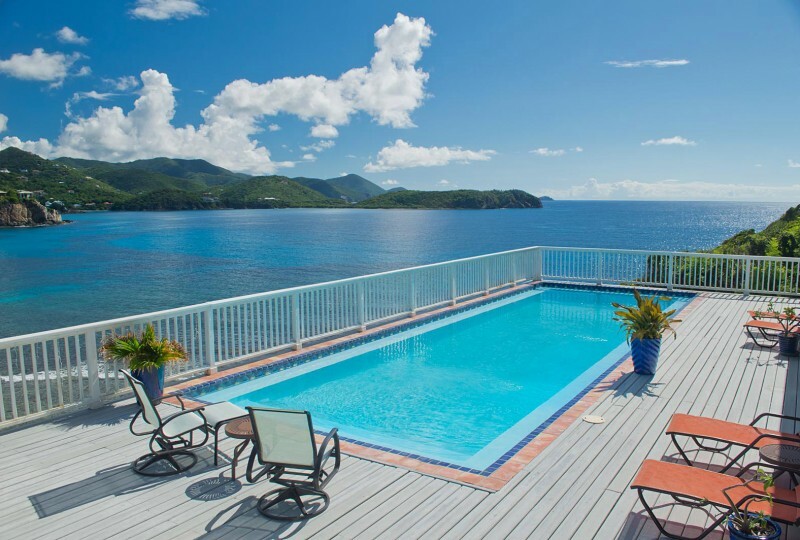 Not included in the rental rates is a Virgin Islands Hotel Tax of 12.5% and a $500.00 refundable security deposit.